In early 2018, fighting intensified along the frontline between the cities of Taïz and Hodeidah by Ansar Allah troops and forces supported by the Saudi and Emirati-led coalition. The coalition-backed forces advanced on the strategic port of Hodeidah, on the Red Sea, before launching an attack on the city on 13 June 2018. In an effort to prevent the advance of the coalition’s ground troops, thousands of mines and improvised explosive devices were planted across the region’s roads and fields. The principal victims of these lethal hazards have been civilians, many of whom have been killed or maimed for life after unwittingly stepping on an explosive device. MSF hospital in Mocha, December 2018. A bell sounds in the yard of the tented hospital, signalling the arrival of yet more patients. A pick-up truck armed with a rocket launcher screeches to a halt and unloads four patients in front of the emergency room. Two are children covered with hastily applied bandages; the other two are already dead. Just a few hours earlier they had been with family members in fields in Mawza, some 30 km away, when someone stepped on a mine. Like them, 14-year-old Nasser was wounded when a mine exploded. A scar on his left hand shows where his thumb was amputated after he was hit by a bullet some years ago. Standing up on his crutches for the first time, he tries to get his balance. Nasser stepped on the mine on 7 December while he, his uncle and cousin were watching over the family’s sheep in a field in Mafraq Al Mocha in Taïz governorate. 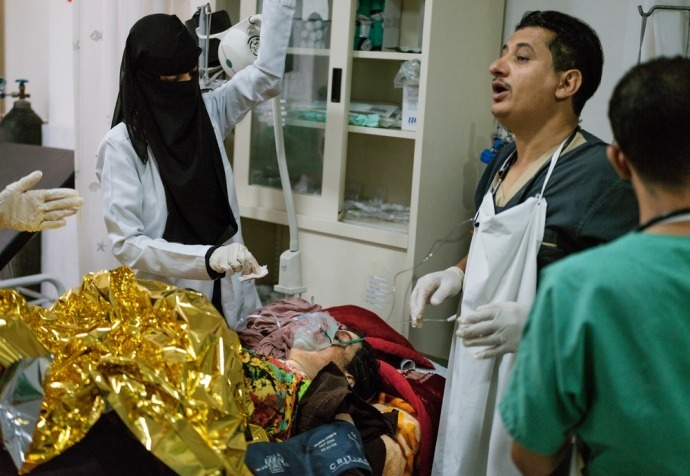 Between August and December 2018, MSF’s teams in Mocha admitted and treated more than 150 people wounded by mines, improvised explosive devices and unexploded ordnance - one third of them children, who had been playing in fields. Disabled for life, they face an uncertain future. The mines also prevent people in agricultural areas from cultivating their fields, which takes a heavy toll on the families who rely on the income. By creating generations of maimed people, mines have far-reaching repercussions – not only for individual families, but for society as a whole, as their victims are likely to be more dependent on others at the same time as being more socially isolated. The mines also prevent people in agricultural areas from cultivating their fields, which takes a heavy toll on the families who rely on the income. Managed almost exclusively by the military, mine clearance is focused on roads and strategic infrastructure, with little heed paid to civilian areas. “Specialist mine clearance organisations and the authorities must step up their efforts to de-mine the region in order to reduce the number of victims,” says MSF head of mission Claire Ha-Duong. As well as demining strategic areas for the military, civilian areas urgently need to be cleared of all types of mines and explosive devices – not only from places where people live but also from agricultural land so that people can access their fields again in safety. "Mines cause particularly severe injuries, so we see complex fractures that are difficult to operate on. Patients often have to have amputations and then require months and months of rehabilitation"